Gone are the days when Reliance Jio was free and unlimited. Now you need to recharge your number regularly to enjoy using the Jio 4G services. Moreover, you get a limited amount of data to be used daily. If you have exhausted your daily data usage limit, your internet speed will be reduced to 128 kbps. Due to the faster speed, 4G network has very high data usage as compared to the 2G & 3G networks. Even 1 GB of data is not enough per day. 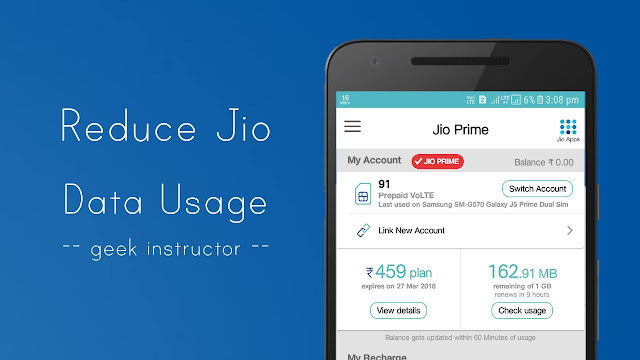 If you are also facing this problem, this tutorial will guide you how to reduce Jio 4G data usage on your phone. Go to Phone Settings > Data Usage. 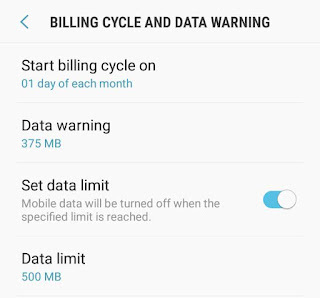 Now turn on "Set data limit" option and input the data limit you want set. You can also set "Data warning" to get an alert notification when the specified limit is reached. Apps running in the background are constantly eating your data even when they are not in use. There are so many apps that consume a lot of data to get new updates, notifications, messages, syncing etc. This is the main reason for high data consumption on your phone. Now click on menu button (three dots). From the list, click "Restrict background data" option. Finally, click "Ok" button to allow the permission. Samsung smartphones have another useful feature named Ultra Data Saving Mode. In addition to restricting the background data, this feature will also compress the data using Opera Max VPN. Most of the Jio 4G data is wasted on watching online videos. If you watch videos on YouTube daily, you can save up to 50% data by reducing the video quality. It's not necessary to watch every video in 1080 HD quality. If you watch the same video on YouTube multiple times (song, for example), you can download it on your phone. Now YouTube app also allows you to save your favorite video offline so that can watch it any number of times without wasting your internet data. UC Browser & Google Chrome are two of the most popular mobile browsers. Both of them can help you save Jio data while surfing the Internet. In UC Browser, you can enable the ad-block feature to prevent it from loading annoying ads. You can also reduce the image quality and access websites like Facebook and Twitter in mobile basic version. Open Google Chrome and tap menu button (three dots at the top). Now go to Settings > Data Saver. Switch on the toggle button. VPN (or Virtual Private Network) is a technology that creates a safe and encrypted connection over a less secured network, like a public Wi-Fi. VPN apps can also help you save data usage by compressing the data on their servers. There are so many VPN apps available on Google Play Store for free. Samsung smartphones have pre-installed VPN application named Opera Max. Turn off mobile data - To prevent unnecessary loss of your Jio data, make sure to turn off mobile data when you're not using the Internet. Turn off mobile hotspot - If you want to save your Jio data, stop sharing your phone's internet connection with other devices via hotspot. Turn off location GPS - When GPS is turned on, your phone will constantly use the data to find your location. It's better to turn it off! Disable auto-backup, auto-update, auto-sync and other similar features. 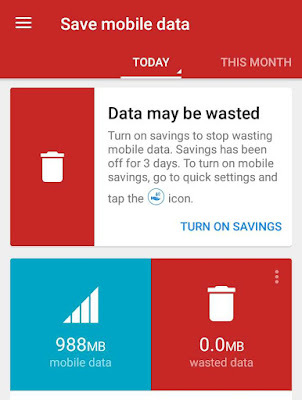 We recommended you to track your data usage at regular intervals so that you will have a rough idea on how to use the remaining data whole day. You can use MyJio app for this task, but there are more advanced apps available on Google Play Store for free. Internet Speed Meter is one such popular app that can help you to monitor your data usage and internet speed. When you open this app, it will automatically start working in the background. You can see real-time internet speed and data usage in the status bar and notification. We hope you have found this guide helpful to reduce Jio data usage on your phone. If you have some questions in your mind, please do share them in the comment section.